Marketers rely heavily on customer data when making marketing decisions. It has long been understood that collecting customer data can lead to increased productivity and increased profits. This technique has given many businesses a competitive edge. Marketing firms around the world invest billions of dollars every single year to be able to capture and eventually leverage customer data. However, there is a dark side to data collection. When marketing firms do not use best practices for protecting their customers, they can potentially put their customer’s data at risk or could create the perception that their practices could potentially harm their customer’s data privacy. When firms pay little attention to the potential negative ramifications their data management efforts have or when they put forth little energy to prevent negative outcomes, they set up a scenario where their customers may have negative feelings or reactions to their data capturing procedures. Simply put, a VPN allows you to connect to the Internet through a private encrypted tunnel that significantly reduces the chance that you will fall victim to a cyber crime. Furthermore, they are easy to use and cheaper than you might think. With a VPN, you can feel safe knowing that the personal information you collect about your clients is received and transmitted privately. It adds an extra layer of security to all of your online interactions. While the encryption used for VPNs can be quite complicated, it’s important to understand that encrypting your data is the first and simplest way to stay safe. It can be tempting for marketers to collect customer data in a nontransparent way. This can be seen when you look at the majority of the privacy policies used in connection with data collection. When there is ambiguity in how a customer’s data is collected or used, it can have a negative impact on the customers image of the marketer, especially if there is a data breach in the future. Transparency from the get-go builds customer confidence and positively affects customer behavior. In 2019, marketers need to be aware of how their competitors are managing customer data. When there is a severe breach, marketers become more aware of what their competition is doing or failed to do to protect customer data. This makes it possible for marketers to avoid the pitfalls of their competitors. They can use this information to create proactive data management policies that protect the information of their clients. Currently, marketers enjoy a level of access to customer information that is unparalleled, especially in modern history. An example of this can be seen when looking at Facebook ads. Facebook ads are the cheapest advertising medium in history. You can get up to 1,000 impressions for just 25 cents. Facebook lets marketers directly target customers based on the information that customers freely share with Facebook. This includes demographic information as well as information on what their potential audience is interested in. Marketers should plan for the day when access to all of this information disappears. They can do this by taking advantage of the data that they have to build a robust following of clients now. Customers may be willing to provide marketers with valuable information about themselves if they feel that they are getting something worthwhile in exchange. This is a lot harder now than it was a few years ago. Just think, when someone asks you for your email address, how reluctant are you to give it out? If you provide your potential customers with something that adds value to their daily lives, such as an informational newsletter or a free tool to help them perform an important task, they may reward you with their personal information. Customers are understandably concerned about sharing their data with a large corporation. There have been enough security breaches made public in the past few years to warrant that concern. As a marketer, use the 2019 year to act more like a human. Customers are more likely to be open and interact and even share personal information with you if they feel like they are interacting with another human as opposed to a faceless corporation that does not care about how their private data is used. If customers feel listened to and cared about, they will likely give you their private data. At the end of the day, you are collecting your customer’s personal data because you want to market to them in a way that’s going to reach their hearts. You can do this by creating “Wow” moments for your customers. You can either do this through your advertising and marketing or by showing your customers how they can create memorable moments and memorable experiences themselves based on the information you have gathered. Social media is changing what customers expect from businesses. The walls that used to exist between companies and businesses are starting to blur. Customers are more likely to trust you with their personal data if they see you as more than just a logo. Legitimate concern over consumer privacy protection has caused governments around the world to employ stricter privacy regulations. An example of this is GDRP, which requires marketers to explicitly ask for consent prior to collecting a customer’s information or tracking a user’s identity. These guidelines dictate how businesses must communicate with their customers when breaches have occurred. 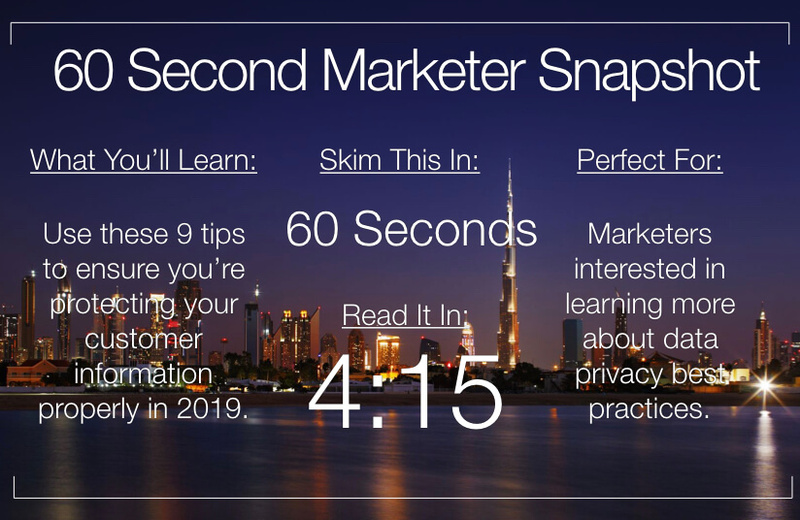 The year 2019 promises to be a year of opportunities for marketers and customers alike. Marketers have the responsibility to protect the data of their customers. By taking steps like using a VPN, staying up to date with privacy regulations, and ethically collecting customer data, they can go a long way in building trust with their clients and creating an environment that will make them more likely to share their personal data with confidence in the future.